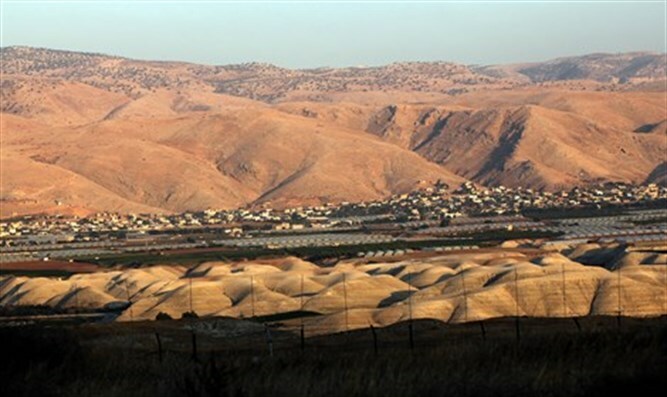 Jordan Valley Regional Council head David Elhiyani accused the Civil Administration in Judea and Samaria of running a 'state within a state' and called for its dismantling. In an interview with Arutz Sheva, Elhiyani explained why he believes Israel should unilaterally disengage from the Palestinian Authority and not seek a diplomatic agreement with it. "If we want to preserve the Land of Israel, if we want to preserve our national character, we must separate from the Palestinians. I do not speak in terms of 'two states for two peoples', because I think this is a mistaken approach. It is a kind of arrogance to decide what the Palestinians want. Let them decide," said Elhiyani. He said that it is in Israel's interests to separate from the PA. "If we do not separate, we will lose our G-d-given rights in Judea and Samaria and in the Jordan Valley, which we control today. Because at any given moment the Palestinians are taking over land in Judea, Samaria and the Jordan Valley. There will never be a political settlement. The Palestinians will never give up one centimeter of land. They will not be able to make a political settlement." "I do not think we have to reach an agreement with them. The State of Israel should come and say 'This is the reality. Take your territory. The moment we separate them from all the complaints against the State of Israel that we control them will no longer exist. Elhiayni warned that if the State of Israel does not decide what its security and settlement interests are in Judea, Samaria and the Jordan Valley, "then in 10 years we will reach a situation where they will take over and take over thousands of dunams of state land every day, and enter into the firing zones under the auspices of the courts and the Civil Administration." "Their ability to settle today is much higher and we could lose everything we have. Right now we still have a chance to get 40-50 percent of the fields, so let's do it. Are we waiting for them to take over Judea and Samaria and the Jordan Valley? What are we waiting for? For the Civil Administration to promote 50 programs just for them? He called for the dismantling of the Civil Administration, which he said identifies with the "occupation" narrative and perpetuates it. "There is an absurd situation in which the Palestinians appreciate and love the Civil Administration because it represents their interests. It gives them economic entrepreneurship in Area C and allows them to set up plans in Area C. There are seven programs that the director promotes for the Palestinians in the Jordan Valley." Areas A and B, according to the Oslo Accords, are under PA jurisdiction, while Area C is under Israeli jurisdiction. All the Jews of Judea and Samaria live in Area C and there have been many calls, including that of the Jewish Home Party, to annex it. "This body has to be completely dismantled because it only serves the Palestinians. There will be no political agreement, the Palestinians will not agree to accept less than one hundred percent of the territory. A vacuum was created in which the Coordinator of Government Activities in the Territories turned the Civil Administration into an operational arm without the knowledge of the ministers of the government and the cabinet. "This is an attempt at a quiet military coup by the Civil Administration and COGAT in order to change the reality in Judea and Samaria and Area C, and they do not have this mandate [from the public] . This is a political decision, which neither COGAT or the Civil Administration have [the authority to make]. Someone needs to wake up." The Civil Administration said in response: "We regret the baseless claims and the slander [against us]. Again, the head of the Jordan Valley Council attacks IDF officers who perform their duties loyally and in accordance with political directives. The Civil Administration will continue to carry out its missions and fulfill its responsibilities in accordance with the policy of the IDF and the political echelon. "